The handwriting of Ana Maria and Stere have been turned into fonts and added to the 9 already on Homelessfonts, a project which transforms the calligraphy of people who have lived on the street into fonts that individuals or businesses can purchase and use in their projects. Moreover, the website now includes the possibility of trying and previewing the fonts. “My handwriting is open, fun, easily understood, and expresses what I feel. I love that people understand what I’m expressing and feel.” That’s how Ana Maria defines her handwriting. After a complicated and unstable life, and spending 21 days in a coma, she fell in love with a Dutchman who lived on the street and decided to live with him. She spent 10 years living in the open, during the summer sleeping on the beach and in winter in open bank branches. She left the street 6 years ago and now lives in an apartment of the Arrels Foundation. Stere lived for 6 years on the streets of Barcelona. After arriving from Romania in 1999 he worked in some construction and restaurant jobs, but never had enough to settle down. “Life on the street is very hard and sad, I don’t wish it for anyone. It’s best to forget it, even though you can’t.” It’s been 10 years since he left the street and he currently lives in a shared apartment. The project website now includes some new features that make it more user-friendly and practical. Moreover, each of the 11 fonts can now be tested and previewed instantly. How can I buy a font? For individual use in one’s documents, memos, designs, and marketing (in limited copies). This license costs 19€. For professional use in marketing purposes such as advertising, corporate materials, website, etc. The cost of this license is 290€. 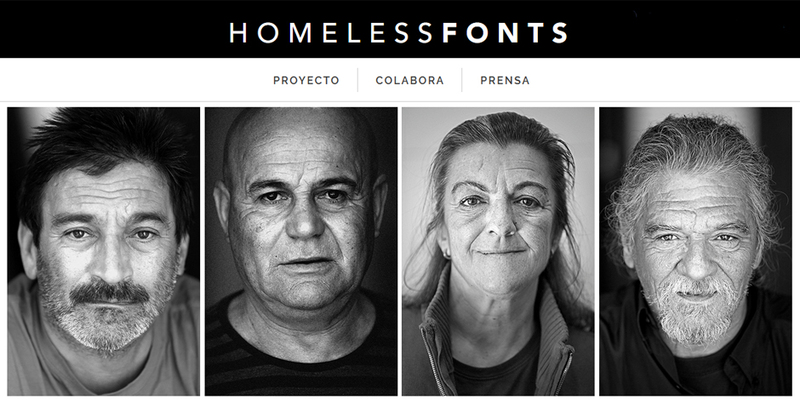 To acquire one of the 11 fonts, go to the website of Homelessfonts and choose the one that best fits your needs. All of the benefits are dedicated to the people helped by the Arrels Foundation. #nobodysleepingonthestreet, together we can rewrite the stories of the street!